If you’re a blogger or generating any type of online content designed to pull in visitors, developing a solid strategy for SEO is critical. 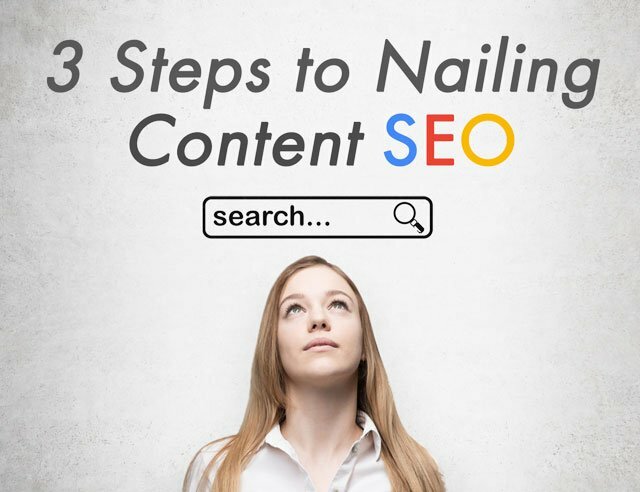 But if you’re not sure how to get started, I’m going to layout a simple, 3-step SEO strategy that will help you create content that gets found by search engines and clicked on by searchers. Write “great” content. What works for readers? What works for Google? Make your content stand out in search engine result pages (SERP). You don’t win until they click on your link. There are no “tricks” or “gimmicks” here. Creating content that works for SEO should be a natural extension of your core publishing focus – writing meaningful content that your readers want to read. However, incorporating SEO into the process up front actually makes your content better, by identifying topics your audience truly is interested in (not just what you “think” they may want to read), and by ensuring your content is actually found in the first place. SEO shouldn’t be your only reader acquisition strategy. But with 64% of site visitors coming via search engines, on average, it’s far too important not to take seriously. This first step sets the stage for everything else that follows and is the most important for ensuring that your content gets found in search. To use the analogy of a “tree falling in the forest with no one there to hear it”, you can write the greatest article ever known to Mankind, but if no one is searching for the topic, it won’t make one lick of difference as far as driving search engine traffic. Instead, you should be using a balanced qualitative/quantitative process to determine what topics really excites your audience. What questions and concerns have your readers been asking you about? What is your competition writing about that is generating a significant number of comments or shares? The quantitative component supplements the qualitative by looking at how well your articles are already performing in search and exploring opportunities to build on your existing success (and correct your failures). The best way to do this is by using Google Webmaster Tools, which is free and easy to use. The Search Analytics section of Webmaster Tools provides extensive data on how often each of your articles appeared in a search result, its average position on the search result page, and the number of people who actually clicked on your article versus your competition. You can also see the data organized by Search Term (i.e., what the user actually typed in search). Using this information, it’s easy to identify which topics are most popular and write more articles about them. By looking at the search terms, you may also discover that your articles are receiving traffic for search terms that are somewhat off topic (e.g., your article about “Best Minivan” is receiving traffic from people searching for “Best Budget Minivan”), so a more targeted article may be an opportunity to appeal to that potential audience segment. That there is enough search volume to warrant your choice. You have a high likelihood of competing successfully for those searches against your competition. When it comes to search volume, Google again comes through with its free Adwords platform. Adwords is traditionally used for advertisers to buy ads, and contains a terrific search volume analyzer called Keyword Planer that helps advertisers determine where to place their bids. We’re going to use that same tool to validate our article topics. You can find Keyword Planer under the Tools menu in Adwords. Then click on “Search for new keywords using a phrase, website or category”. Enter your proposed article topic (keep this short, should be the topic, not an article title) in the “Your product or service” field and click Get Ideas. Adwords will show you a list of “Ad group ideas” related to your topic, showing average monthly search volume for each. The data can be used in a number of ways, including judging whether there is enough search volume to write an article or refining your topic to more closely match actual searches. Remember, your article topic doesn’t have to match a search term exactly to show up in search results. In the example below, an article about “Best Minivan” may still show up in a search for “Best used minivan” if Google decides there is a high enough degree of relevance, though an article about “Best Used Minivan” will almost certainly do better (the flipside being that it may do worse in a more general search). When SEO folks talk about “long tail SEO” and “short tail SEO”, the minivan example is what they’re referring to. You have to make a choice whether you want to compete for popular, broad topics (short tail), where there may be more competition, or focus on narrow, specialized topics (long tail) where you have a greater chance of ranking highly in search results. 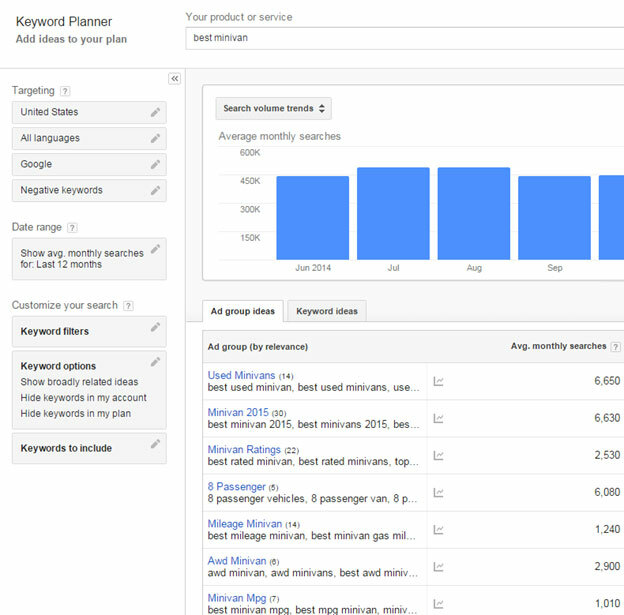 You can also use the “Keyword ideas” tab to look at the search volume for search volume on a single, precise keyword. Usually, the volume will be pretty small for each one. However, you may find a couple of surprises that will help guide your topic choice or inspire a new topic. I have found no better way to research your competition for a topic than to enter the each search term in Google and see who else pops up on page 1 (the only page that really matters, as I’ll show you later). Am I competing against huge media brands or obscure blogs? How on-topic are the articles? One important caveat, when doing your analysis in Google, always do it in “Incognito mode” and don’t log into Google. Otherwise, Google will tailor the search results based on your prior searches, badly skewing the results. In many cases, you may be better off getting a large percentage of the search from a more obscure term than getting a tiny percent from a highly searched term. Plus, the people coming to your article may be better engaged as your article is narrowly focused on their interest. Now that you’ve got your topics nailed, it’s time to start writing. Your goal here is to get your content onto the first page of google for search results related to your topic, and the higher up on that first page, the better. 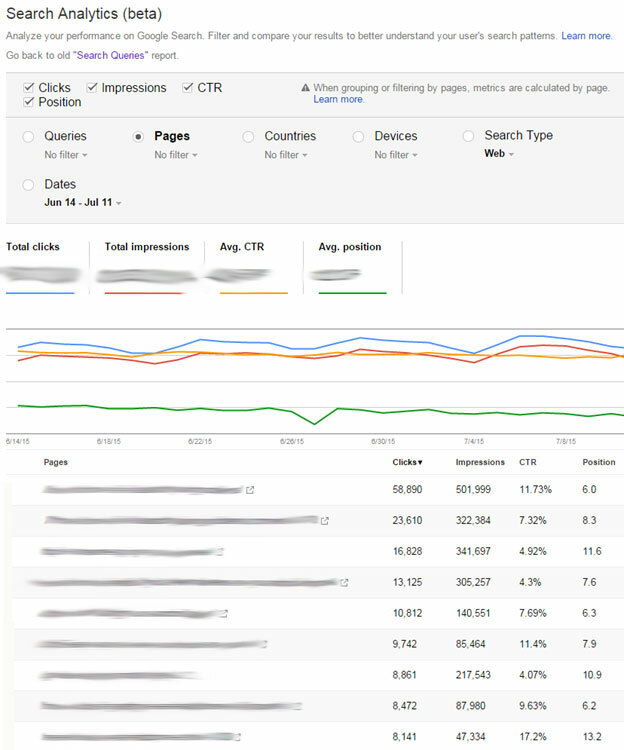 It really is hard to overstate how important your ranking position is to driving traffic. 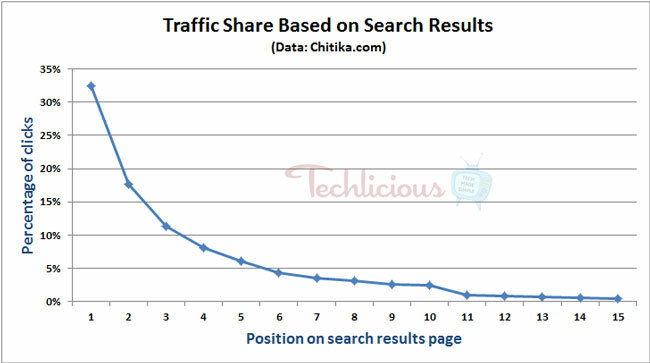 A recent study by Chitika looked at click rate versus SERP position – and the results are striking. The first position on the SERP garnered 33% of the clicks, on average. By the time you get to the 5th position, that number drops to 6%. And if you’re on page 2 of the search results (11th position and beyond), fuhgeddaboudit. The important thing to keep in mind here is that when it comes to SEO, what works well for your readers also works well for Google. If you’re writing well-written pieces that provide excellent advice/insight to your readers, Google will recognize that. You can and should use the search term(s) you’re gunning for in your writing, especially near the top of your content. But, don’t keyword stuff. Not only is this annoying to read but, if you go overboard, Google may actually view your content as spammy. Unlike real readers, search engines generally can't interpret non-text items. So when inserting pictures, videos or anything within an iFrame into your post, make sure to include descriptive data (alt text) and file name to let search engines know what the item represents. No matter how beautiful that infographic is, it won't take the place of real textual content for SEO purposes. What is optimal content length for SEO? How long your content should be to optimize SEO has been a topic of much discussion, with few quantitative studies to support specific recommendations. The consensus, based on various anecdotal stories, suggests a minimum of around 500 words if you hoped to get ranked, with significant returns as you exceed 1,000 words up to around 2,000 words. One widely quoted study from 2012 by serpIQ, an SEO marketing firm, found that the average content length of articles in the first ten positions of a series of search results they conducted was just over 2,000 words, declining slightly as you moved from the first position to the tenth. However, that word count includes all content on the page (including comments and side bar language), so the actually article length is somewhat less. Also, it’s not clear whether the content length is driving the SEO benefit or that is a secondary affect from longer articles being linked to more frequently from other sites and shared more often, and it is really the engagement that is driving the SEO benefit. Other studies of content length have generally landed at the same conclusion, suggesting a 1,500 to 2,000 word length as optimal. Based on our experience at Techlicious, we would concur with that. Our biggest drivers of search traffic are our in-depth review and advice stories, which almost always run 1,000–2,000 words. When you add in the comments generated by these stories, word counts go well over 2,000. The first thing you see when you do a Google Search (or Bing, or any other search engine) is a list of titles. This is your first (and sometimes only) chance to grab that searcher’s attention. Your article title needs to be both eye-catching and compelling enough to make that readers want to read more. Here’s what works. Make your title highly relevant to your topic. Seems obvious but, if you’re used to writing for the old print world, clever titles were perfectly acceptable, since someone already had the magazine or paper in hand. In the online world, this doesn’t fly. People need to know that your article is about what they’re searching for when they see it in search results or they’ll move on. Numbered list titles (e.g., “The 6 Best Minivans for Gas Mileage”) have been shown to do particularly well for search. They can be horribly overused (have you ever been to a site where every article is a numbered list – ugh! ), but in the appropriate place at the appropriate time, they work. Keep your titles to an absolute maximum length of 70 characters. Any longer and it’s going to get cut off in the search results, undermining all your hard work. The article snippet is the subtext that appears below the title in search results. This is an incredibly important second opportunity to market your article to searchers and get them to click. So don’t skimp on the attention you put into writing this. And don’t repeat your title or lazily copy the first paragraph or your article! You need to come up with a pitch specifically crafted for this purpose. Usually, Google will use the content found in your article’s “meta description” as the rich snippet (Don’t worry if you don’t know what this means from a technical perspective, every CMS tool should have a field for writing this. To make sure you are creating the snippet correctly, you can check by “viewing the page source” of an article from within your browser and looking for code near the top that says "meta content="YOUR SNIPPET TEXT" name="description".). However, for search results, Google may decide to use blocks of content from within the article that it thinks better represents what the user is searching for, especially if that block shares the key words or term being searched for. When writing your snippet, keep the maximum length to 160 characters; longer, and it will be cut off in search results or Google may ignore it entirely. You can check whether your title and snippet combinations are working effectively through Webmaster Tools search analytics. Those articles showing up highly in SERPs, yet with very low click rates, may benefit from a tweaking of the title/snippet. This article is intended to cover the core foundation of an SEO strategy for content. The advice is based on considerable research I’ve done on the topic, as well as our own experiences here at Techlicious. There are many, many other factors that have an impact on search performance, from site speed to rich snippet quality, but everything else needs to be built on this existing foundation. If you want to dive deeper into SEO, I recommend Rand Fishkin’s moz.com and Danny Sullivan’s searchengineland.com as two excellent places to start. Both are very highly regarded in the SEO space and offer advice on a wide range of topics. To get questions answered, the GoogleWebmasterHelp channel in YouTube (run by the Google Search team) is the place to turn. There are dozens of videos by Matt Cutts, Google’s former search ambassador, that address specific issues faced by web owners and dispel many common SEO myths. Google also holds regular live Hangouts where experts from Google’s search team answer questions. It doesn’t get any closer to the horse’s mouth than that.